DRG Publishing recently released a new how-to-quill book called Quill It Easy. The colorful book is filled with simple, to fairly simple projects and detailed instructions - perfect for those who are new to the quilling world, but also great if you're experienced and just looking for fresh ideas. It was edited by Tanya Fox, who has a knack for knowing what's current and desirable in the paper crafting industry. I was pleased when she asked me to be her go-to person when it came to writing the technique instructions and making the shape samples for the gallery. Several of my designs are included in the book, along with projects from quite a few other quillers, perhaps most notably, Alli Bartkowski, maker of the appealing Quilled Creations kits. 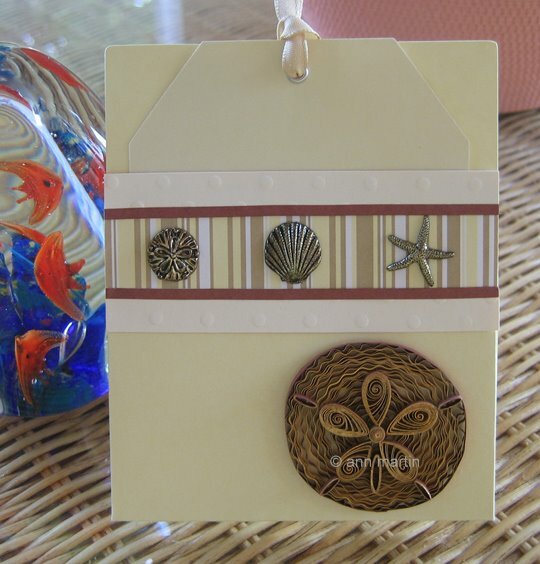 This is one of my ideas that's featured in the book - a cheerful little gift card, perfect as a starter project. And this is another - a simple sand dollar... and now I'm thinking of eating juicy cherries on a sun-warmed, shell-strewn beach... come on, summer! I love both projects but especially the cherries! So simple and striking! Alli Bartkowski lives just a few miles from me. Maybe I told you, I discovered this when I ordered some supplies from Quilled Creations and they arrived in my mailbox the next day. I was shocked to see a Fairport return address - I hadn't looked at that part of the website. One time when I was in a big fat hurry, she let me come to her house to pick something up. She rocks! 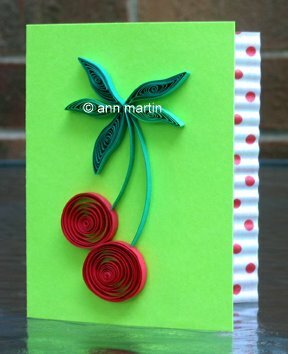 Ann it would be great if you'd write your own quilling book. Your designs are always so great and I can't think of anyone else who could do a better job.